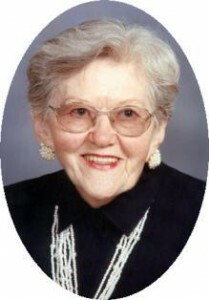 Leona S. Simons, 87, of Lincoln Village Apartments, 1300 W. Lincoln Ave., Port Washington died with the loving support of her family at her side on Thursday, February 24, 2011 at Horizon Hospice at Columbia St. Mary’s Hospital-Ozaukee Campus in Mequon, WI. She was born on November 3, 1923, in Milwaukee, WI, daughter of John A. and Anna Stachurski Sieracke. She grew up on the northside of Milwaukee. On May 16, 1942, she married Bernard M. “Ben” Simons of New Franken, WI at St. Gall’s Catholic Church in Milwaukee. Together they raised their family in West Allis. In 1991, they moved to Saukville to be near family. Ben preceded her in death on May 9, 1995. A loving homemaker, she held various jobs after raising her children. She will be remembered for her unique personality. When out and about and asked how she was feeling; she would say “twice as sassy”. A 10+ year survivor of breast cancer when told to have a good day, she’d reply “I plan to and if I don’t it’s my own fault”. She loved to watch mysteries on television. She was an avid reader; coming home from the library with a shopping bag full of mystery books at a time. She had her beloved cats Prince and Star. They were her constant companions and slept with her every night. She missed them terribly when they passed away last year. She is survived by her children Mary Ann (Ken) Nuernberg of Saukville, Laurie (Fred) Meyer of Farmington, WI and Philip (Linda) Simons of West Bend; 8 grandchildren, 10 great-grandchildren; sister Dawn (Eugene �Gene�) Modrzejewski of Portage, brother John (Jane) Sieracke of Sheboygan, nieces, nephews, other relatives and friends. She is preceded in death by her husband, grandson Adam Meyer and sister Beverly Byron. Mass of Christian Burial will be celebrated at 6:30PM Monday, February 28, 2011 at Immaculate Conception Catholic Church, 145 Church St., Saukville. Reverend Thomas Lijewski and Reverend Karl Acker will con-celebrate. Visitation will be after 4PM Monday AT CHURCH. Interment will in Rural Home Cemetery of Big Bend, WI. Memorials to the Oscar Grady Library or the Ozaukee Humane Society, both of Saukville are appreciated.